Both these practices -- donating to the food bank or giving out socks -- are similar: they make the giver feel good, while ensuring the giver does not have to directly give the poor person money and worry that it will be 'misspent' on alcohol, drugs or cigarettes. Presently, Nova Scotia taxpayers are footing the bill for projects such as a new Halifax convention centre ($160 million), and a bailout for 93 mink farmers ($9 million). The NS government has just issued a payroll tax rebate for Lockheed Martin ($6.5 million over 7 years). That works out to the McNeil government subsidising Lockheed-Martin $4,642.86 per employee -- which is 10% more than what a single person on welfare is given to live on every year (after their housing allowance is paid). I think that $175 million could go a long way to build affordable housing for the homeless and the poor – it’d be a start. Judy Haiven teaches in the Management Dept at the Sobey School of Business at Saint Mary's University. She is chair of the Canadian Centre for Policy Alternatives-Nova Scotia. Submitted by katiemjy on Mon, 01/05/2015 - 00:04. This is rather unfair. I heard Enright's editorial and it wasn't nearly as selfish or simplistic as this article paints it. And the CBC here just raised HALF A MILLION BUCKS + a couple of tons of food for the food bank, which is hardly chump change or elitist cast-offs. If she wants to complain, she should take her grievance to the politicians she mentions, the ones cutting social services and wasting money on extravaganzas and ActioPlan ads - millions of $$ wasted on a non-existent program. Submitted by jhaiven on Mon, 01/05/2015 - 07:34.
http://www.cbc.ca/news/canada/nova-scotia/events -- this is a press release from the CBC. It says they collected $94,000 (albeit for this year and they've done it for 5 years) which will feed 5100 families of 4 for a WEEK, plus about 5000 KG of food. Of course the food and money does some good. But Saturday's Herald article (p. f2) "Providing decent meal for struggling families" by Dr Patricia Williams explains that food banks are not a vision for food security for the poor. Submitted by katiemjy on Mon, 01/05/2015 - 23:16. The figures I quoted the CBC as having raised were for Metro Toronto, where I'm writing from. And of course food banks are not optimal. But I actually re-listened to the Enright editorial to see if somehow I'd missed something, and have to say again, he ain't the enemy. Go after the REAL wasters. Submitted by Steve Caines on Mon, 01/05/2015 - 20:02. Submitted by jhaiven on Mon, 01/05/2015 - 20:22. Submitted by Erica Lewis on Sat, 01/02/2016 - 20:17. These commenters here must not be on assistance and have never had to go to food banks! A small amount of high sodium, high carb, low nutrient food once or twice a week makes very little difference to a person living in abject poverty. It keeps them from actually dying of starvation, that is all. It does not help them in any way to have any quality of life, any happiness, any hope, or to maintain good health and avoid the long-term effects of chronic poverty and malnutrition. Giving a few cans of food to a food bank is a social affectation, nothing more. The people who have the most ability to affect real change are the wealthiest ones and since they are not suffering from lack of food, safe housing, and other necessities, they have no incentive to take on any projects that make a real difference. 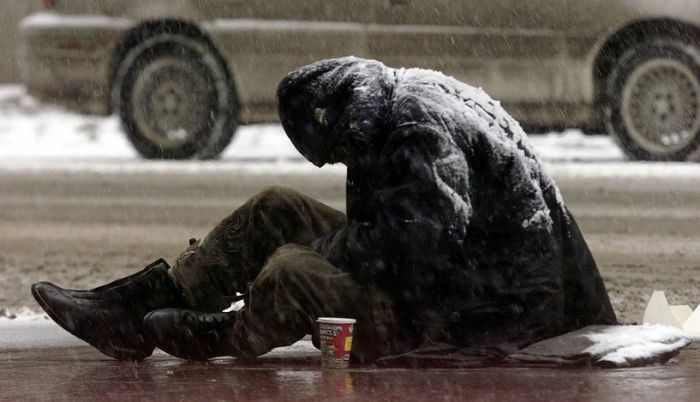 Hundreds of millions is required to combat poverty in Canada, not hundreds of thousands.